Racing on an older bike? I'm currently riding an early 90's Panasonic dx2000. I'm saving up for a nicer bike that will have things like STI shifters and more than 12 speeds, but it's going to take me a while. I enjoy going out on training rides, and participate in some lunch races at work. When we race at lunch, I'm one of the "fast guys" in a group of marathoners and generally pretty fit individulas. I know I could be even faster with a newer bike, and I want to start doing actual races (most likely criteriums), but I'm worried that I'll be outgunned by people with newer equipment on their bikes. I've lost a few sprints for the townsigns to one of the guys who's riding a Madone, and I can generally stick with him until he starts hammering through the gears while I've got one hand off the handlebars frantically trying to shift. Has anyone here started out like this? Should I just try some races and see if I can keep up? Or wait until I can buy myself a new bike? Just get out there and do it. Don't worry about trying to win your first few races....just go out, have fun, and gain some experience. Forget that. USCF changed the rules, you now have to have a bike no older than 1 year in order to get a license. And if you don't win one of the first 5 races you do, you are required to lose interest in bicycle racing altogether and you are banned from the BF Road Bike Racing forum. The only thing that is really putting you at a disadvantage is no STI shifters. Its a huge advantage to be able to go throught the gears quickly and especially while out of the saddle sprinting. I guess that's really what I'm worried about. Like I said, I've been burned by that before, and I'm just wondering if the newer shifters make enough of a difference where I'll really get dropped. Then again, I look at what I just wrote, and it seems silly. It's all about the engine, right? Ah, I saw a few DT shifters at my last race. You should still be fine, they won't be the make-or-break in Cat 5. I would say that, in the beginning at least, it's not even so much about the engine, but about the mind, getting used to the intensity, etc. of a race, which is a lot different than town-line sprints on the club ride. In all seriousness, just go do it. A few times (your first time may be a little off-putting). If you feel like you need a new bike, fine, get one. But you'll be fine on what you have, too. - you will have is the inability to shift and not have the change in the gear-ration be so completely different that it creates an inefficiency in your cadence. 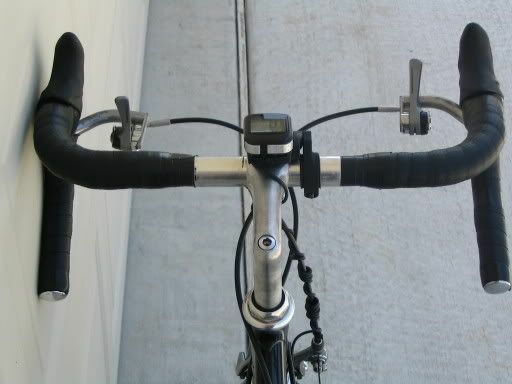 - Downtube shifters as you stated are not good in sprints. However - go with it anyways. First of all, your legs are what will determine if you win or not in most cases. And since you are newer to racing, you will find that your legs are really what are going to give you problems in most races. Also - the CRASH 5's are not the race you want to take a new carbon bike too. Your bike is a perfect bike to wreck, since the loss will not completely set you back. Secondly- if you like the bike, it might be beneficial to change to a cheap pair of Tiagra components until you can afford a new bike. This would eliminate the downtube shifting problem. Hey, most of us on BF started out like this, or close to it. I started with a old 1987 Trek 660S, graduated to a Basso Lotto with full campy record with ergo shifting. Recently bought a few good road bikes....one being a new tommaso aggrzaito carbon fiber with ultegra and dura ace. Todays bikes shift much better (hands on the bars) lighter, faster, materials are better. Keep up what your doing until you can make the jump to something nicer. You will be impressed. I agree for the most part what people say. A new bike wont make you faster per se but it will give you the ability to jump better and to shift while standing is a very nice feature when in rolling terrain or about to climb a hill. If you dont start the sprint in the right gear you are doomed anyway. It is a big advantage, but not insurmountable. Learn to spin, like San Rensho did in the day and you can compete without STI. Also, you can even learn to click up a gear with downtube indexed shifting with a knee mid sprint. It's amazing the things that could be done pre STI. I've even heard its possible to shift the front and back derailleur simultaneously one handed with friction down tube shifters. Certain skiils have been lost with the advancement of technology. Did this accidentally once going up a climb (not in a sprint) while standing. It hurt. The lack of STI only comes into play during jumps and sprints. Since you're probably not going to be a front runner in the final sprint yet, that's not a big deal... for now. I'll get my old bike out and give a demo about "racing in the old days"
I ride an 80's steel bike and use Kelly "Take Offs" which help you mount DT shifters on the bars. It's a decent compromise between DT and STI. I prefer downtube shifters, and IIRC the Crit National Championships were won last year or the year before on a DT-equipped bike. Go for it, what's the worst that can happen? Eddy M won a lot of races with DT shifters. That won't hold you back. Never seen that before in my life! What a great idea. Go ahead and race. I've got a friend who while saving up for a new bike was racing cat-3 and regularly placing top-5 on an early 90s Trek 1200 w/downtube shifters. It's actually easy to shift the front and rear in one motion because the levers are so close. to the OP - go out and race, just make sure the bike you have is mechanically sound.